NOAA released the latest stats concerning last week's tornado outbreak in the South. The organization's current tornado estimate is 305 as of Wednesday, May 4. If this number is correct, it is the largest outbreak in history, surpassing the April 3-4, 1974, outbreak, which spawned 148. The NWS has surveyed damage from 178 tornadoes. Thus far, the NWS has classified two EF-5 tornadoes, four EF-4 and 21 EF-3. 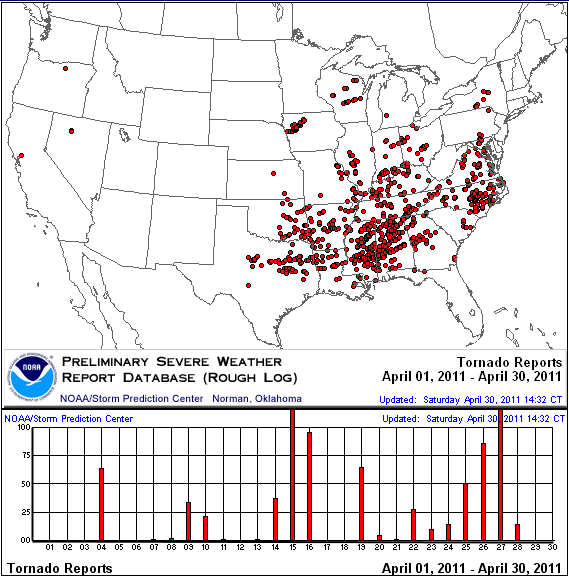 This outbreak brought the April 2011 tornado count past 600, shattering the previous April record of 267, set in 1974. This number also breaks the record for most tornadoes in any month in recorded history. The previous number was 542, set in May 2003.